The first thing that hits you about the début EP/single from the Australian-based sibling duo is just how big it sounds. With influences gleaned from the likes of VNV Nation, BlutEngel, The Crüxshadows and Epica, Revenant Cult have certainly got their eyes set on filling dance floors across the world. 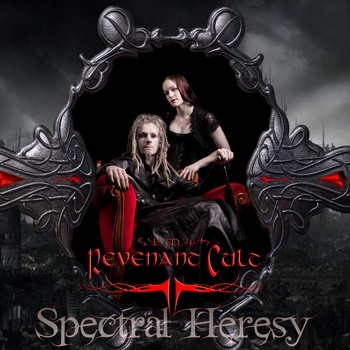 'Spectral Heresy' sees the band making a strong first impression with a style that falls somewhere between darkwave and ebm with strong operatic vocals dominating the mix. It does, at times, feel a little bit “Eurovision” in terms of some of the synthesizer sounds, but despite being seven-minutes long it does a very good job at holding the listeners attention. Also, for a relatively new project the production is quite professional and really is only let down in a few places where the mix gets particularly swamped by the various electronics vying for attention. What is a shame is the fact there is no B-side to speak of, which seems to be an increasing trend these days. Instead we get four distinct remixes from Blast Radius, Assemblage 23, Studio-X and Aeon which all compliment the dance orientated underbelly of the song. Individually each remix is very strong and will no doubt find willing homes in many DJ sets. But when presented on a single in this way it all feels a little bit repetitive. Which is unfortunate considering it is a pretty good song. Revenant Cult declare their intentions with zeal on 'Spectral Heresy', crafting a track that will work very well both as a floor filler as well as a part of a live performance. It would have been nice to have a little more variety presented though with perhaps another song or even an instrumental included, instead of just tacking on remixes for what seems like the sake of it. But what should be acknowledged is that there is a hell of a lot of potential presented here.